Astrid Riecken/For The Washington Post - Rev. Anthony Motley takes a walk around the new campus of the Department of Homeland Security, which moved to the west campus of the former St. Elizabeth Hospital. Motley, who grew up in the neighborhood around the campus, has been on the advisory committee for the project of rebuilding the old campus of the former hospital. In the aftermath of the Sept. 11, 2001, attacks, the George W. Bush administration called for a new, centralized headquarters to strengthen the department’s ability to coordinate the fight against terrorism and respond to natural disasters. More than 50 historic buildings would be renovated and new ones erected on the grounds of St. Elizabeths, a onetime insane asylum with a panoramic view of the District. Instead, with the exception of a Coast Guard building that opened last year, the grounds remain entirely undeveloped, with the occasional deer grazing amid the vacant Gothic Revival-style structures. The budget has ballooned to $4.5 billion, with completion pushed back to 2026. Even now, as Obama administration officials make the best of their limited funding, they have started design work for a second building that congressional aides and others familiar with the project say may never open. The entire complex was to be finished as early as this year, at a cost of less than $3 billion, according to the initial plan. A decade after work began, the St. Elizabeths venture — the capital region’s largest planned construction project since the Pentagon — has become a monumental example of Washington inefficiency and drift. Bedeviled by partisan brawling, it has been starved of funds by both Republicans and Democrats in Congress and received only lackluster support from the Obama administration, according to budget documents and interviews with current and former federal officials. The crippling shortfall in funding has created a vicious cycle, causing delays that in turn inflated the projected price tag as construction costs escalated over time and DHS agencies — still scattered in more than 50 locations across the Washington area — have been signing expensive temporary leases. A DHS spokeswoman did not respond to repeated e-mails requesting comment. Even before the cost began to soar, the government was going to have to pay a premium because of expenses associated with St. Elizabeths’s status as a national historic landmark. Planners were aware they would face millions of dollars in outlays for historic preservation and rehabilitation of antiquated utilities and infrastructure. But other costs were not anticipated. Only after getting the first master plan approved in 2009 did officials discover that more than $100 million in additional transportation improvements, such as an expanded highway interchange, would be needed so that traffic would not overwhelm the nearby Congress Heights and Anacostia neighborhoods, according to documents and federal officials. At the rate that Congress is approving funding for the project, even the revised completion date of 2026 is unrealistic, and some lawmakers are urging that plans for such an ambitious headquarters complex be scrapped. At a time of fiscal austerity, money for the project is elusive. “I suspect there is no constituency for building a new headquarters complex right now,” he said. The DHS was born at a time when the wounds of Sept. 11 were still fresh and homeland security was the top national priority. The new department melded agencies as diverse as the Secret Service and Immigration and Customs Enforcement, aiming to eliminate gaps in coordination and poor communication that had helped make possible the attacks on the World Trade Center and Pentagon. By 2004, department officials were complaining that their headquarters on Nebraska Avenue in the District was one-quarter of the size needed. The operations center was small, with limited infrastructure. And with various DHS components dispersed as far as Herndon, Va., the department was wasting millions on leased office space and transportation costs. These logistical problems slowed the government response to Hurricane Katrina in 2005 and to a 2006 terrorist plot to blow up transatlantic airliners with liquid explosives, Chertoff recalled. “People were shuttling back and forth in those critical days after the plot was exposed, and that just made it much more difficult and time-consuming,” he said. Calling it urgent, Chertoff’s department released a plan in 2006 to begin construction the following year on a new consolidated headquarters with “final occupancy” in fiscal year 2015, at a cost that “may approach as much as $3 billion.” About 14,000 DHS employees would work at the site. Officials selected the St. Elizabeths property from among 14 possibilities because it was the only location that met size and security requirements. For the surrounding, hard-pressed community in Southeast Washington, federal officials promised major benefits. “The new DHS headquarters operations will . . . provide a tremendous economic boost to the Anacostia and Congress Heights neighborhoods,” Bill Guerin, then a top GSA official, told Congress in 2009. Funding ran far short from the start. In 2007, the Bush administration asked for $362 million, but the Democratic-controlled House slashed it to $6 million. “They weren’t going to give Bush that amount of money — because it was Bush,” said a Democrat who was familiar with the House’s thinking at the time and who, like other people interviewed for this article, spoke on the condition of anonymity to discuss internal deliberations. After Barack Obama was elected, it was his administration’s turn to ask Congress for money for the project. Budget documents show that officials have sought far less money than needed to keep the plan on schedule. Priorities had shifted, for instance to funding security along the country’s Southwest border, according to people familiar with the administration’s thinking. And since Republicans took over the House, they have gutted what the administration has requested. The lack of funding has fed even higher costs. Initially, for instance, the plan was to construct the first two buildings at the same time — a headquarters for the Coast Guard and a modern, expanded DHS operations center next door. But at the time, in 2009, the Obama administration asked Congress for just enough money to pay for the Coast Guard building. As a result, crews that had prepared to dig deep underground to construct the two buildings were forced to shift their plans, erecting a wall between the Coast Guard building and the location of the proposed operations center to stabilize the site. Officials said the wall added to the project’s cost but could not say by how much. The crews also had to defer planned utility work that one person familiar with the project said will cost the government at least $30 million extra. As the fiscal problems mounted, so did complications — and costs — stemming from the site’s historic pedigree. The government spent several years negotiating with preservationist groups that feared the project would disturb the site. An agreement with them required numerous steps to protect the site’s historic features. This was never going to be cheap. An analysis of the potential locations completed by the GSA in 2008 cited the “costs associated with the rehabilitation of existing historic structures and landscapes” if the St. Elizabeths property was chosen. The construction budget included $30 million to “repair historical landscape features,” the GSA told Congress in 2010. The government would also have to pay millions more to update antiquated infrastructure and utilities, the GSA said. Planners had also not fully appreciated how much roadwork would be required to accommodate the huge complex. While federal officials had said all along that transportation improvements would be needed, it was only after the government completed a more detailed study that planners saw the size of the task. They found, for instance, that a planned access road to more easily get DHS workers to the headquarters had to be longer than envisioned. They also discovered that an existing interchange between Malcolm X Avenue and Interstate 295 needed to be substantially expanded and reconfigured. Extending the access road and constructing the interchange is now expected by federal officials to cost at least $150 million. Inside the GSA, some officials have long been skeptical of the headquarters project — over whether it is necessary and whether enough funding will ever be obtained, according to people familiar with the undertaking. At the DHS, some felt their agency was being unfairly maligned for the delays in what is essentially a GSA project, the people said. During initial planning for the building to house the offices of the homeland security secretary several years ago, DHS officials raised concerns with the GSA, people familiar with the episode recounted. In the blueprint, employees with lower security clearances would have to pass through a high-security area to move around the rest of building. The DHS said this could not be allowed and asked the GSA to build a million-dollar addition to accommodate the employees with the lower clearances. The GSA balked. Tensions mounted. The dispute was resolved by reorganizing the layout so employees with the same clearance level work in the same part of the building. “It took a while to work through that,’’ recalled a person familiar with the project. While the disagreement did not add to the budget, it did speak to the different conceptions of what the headquarters should be and how much it should cost. A decade after planning began, consensus is still elusive. 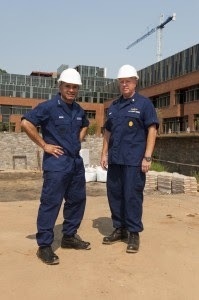 Barely any additional work has been funded beyond the Coast Guard headquarters, which opened last year. Key structures such as the DHS operations center and a headquarters for the Federal Emergency Management Agency mostly remain ink on planning documents. Officials began doing detailed design work on the second building, which will house the DHS secretary and top staffers, only in the past few months. It is unclear whether money will ever be available to finish it. On Capitol Hill, there is no sign of any agreement about how — or whether — to fund the project. A revised administration plan to build it by 2026, given to Congress last year, would require an average of $280 million a year. It got $190 million this year. The document makes clear it “does not constitute a commitment by the Administration” to support even its own projected level of required funding.